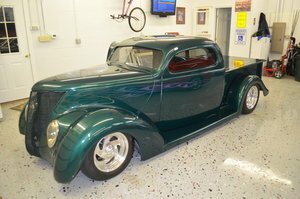 1935 Ford Pickup. 350 c.i. crate motor, turbo 400 transmission, 8\' Ford rear end, front disc brakes, dropped axle front end. Frame, front end and suspension sand blasted and powder coated. All metal body. Clear title. Please Note The Following **Vehicle Location is at our clients home and Not In Cadillac, Michigan. **We do have a showroom with about 25 cars that is by appointment only **Please Call First and talk to one of our reps at 231-468-2809 EXT 1 ** FREE Consignment Visit Our Site Today Easy To List Your Vehicle and Get it Sold in Record Time.